People in ancient times have created stories, myths and legends about flowers, our ancestries had given to flowers magic meanings, compared flowers to people nature according birth date and zodiac signs. The language of flowers was very popular during Victorian-era in England. So, what is the flower language? The language of flowers, sometimes called floriography, was a Victorian-era means of communication in which various flowers and floral arrangements were used to send coded messages, allowing individuals to express feelings which otherwise could not be spoken. Very interesting fact is about Royal wedding in England. All of the flowers were chosen by Middleton with reference to the rather twee "language of flowers", a floral code made popular by Queen Victoria. 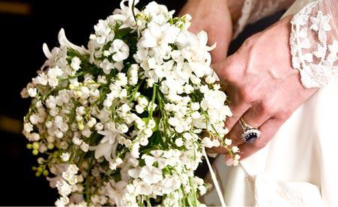 So the signature lily of the valley means "trustworthy", myrtle "hope and love", hornbeams "resilience", and field maples "humility and reserve". Not only twee but also pitfall-laden: lilac is for "youthful innocence" or "disappointment", depending on which version you believe, or just how distrustful you are. There are a lot of legends and myths about flowers in Greek Mythology, legends are beautiful but sometimes too cruel and ruthless. Creating Collection “Whispers of Flowers”, I also looked in East Cultures and flower meaning in China and Japan. Previously I was not excited about chrysanthemums and peonies, but I am looking to them from another angle, now. I wanted to pay attention to flower horoscope. Flower horoscope gives a certain flower to a person depending on the date of birth that influences on the persons character and fortune. Read Flower Horoscope - learn the language and meanings of flowers. That will help you to understand your beloved one better. We have not included all flowers from horoscope in our Collection “Whispers of Flowers”, but we are open to create individual jewel designs and engrave flower meaning according horoscope or flower language in all World languages. January, 1 - January, 10 YELLOW GENTIAN This mysterious flower grows on mountain meadows and symbolizes warm summer. It gives to character some mystery, mostly in outward romantic appearance. For example, the reason of her reticence can be usual shyness. A woman born under this flower is purposeful and persistent in achieving a goal; should avoid cold weather. January, 11 - January, 20 THISTLE Only few people pay to a thistle attention. Trying to draw attention she goes too far and exasperates others. From time to time take upon herself more tasks than she is able to accomplish, afterwards she may give up. Such behaviour confuses others; therefore it becomes difficult to perceive positive features of her character. The better side of her nature is kindness. Woman-thistle is usually a good friend and wife/mother. A diligent worker. Overwork can cause early hypertension. January, 21 - January, 31 IMMORTELE Shy, but nevertheless all the time keeps an eye on fashion and romance. Her elegance usually arouses envy. Nevertheless she has enough energy to overcome all difficulties and withstand ill-wishers. February, 1 - February, 10 MISTLETOE Curiosity, sociability, romantic, smartness and sportsmanlike characterize her nature. She is able to conquer any kind of man. February, 11 - February, 19 BELLADONNA Shy beauty. Most likely you will fail to conquer her heart from the first. She has much energy to repulse any tricks. Try your best next time. February, 20 - February, 28 MIMOSA She is like a flower, very sensitive and romantic. She feels upset being underestimated. Do not drive her hard! She is very diligent and got used to give too much of herself to discharge her obligations. Overwork may weaken her strength! March, 1 - March, 10 POPPY Her beauty acts like opium. You may quickly fall into her trap, but you'll not be rid of her so easily. Course of her life is full of thorns. To succeed in doing something Poppy should be more confident of herself. Avoid meat dishes. Vegetables are a source of vitamins and a good mood. March, 11 - March, 20 LILY Concealed charm. Refined manners. A moonflower. She is wrapped in a mystery, which could be unraveled on full moon. Masquerades, deceit, flirt, romance... In spite of everything, Lily succeeds in happiness. March, 21 - March, 31 Foxglove Unlike a flower – unattractive straw-coloured - women born under it differs in resoluteness. Her head operates like a computer – precisely and quickly, finding a correct way out even from the most knotty life situation. She never loses her presence of mind. However in the course of time nerves become weakened. April, 1 - April, 10 MAGNOLIA Ambition, desire always and everywhere to be the first are distinctive features of Magnolia. However her social status is rather instable because of unwillingness to listen to advice of others. April, 11 - April, 20 HYDRANGEA She is magnanimous, lavish and sociable. But such soul’s breadth often irritates others who wait for her definite help. April, 21 - April, 30 DAHLIA Magnificent Dahlia should always hold the happy medium. Maximalism frequently prevents from success. Dahlia, try to estimate your chances for a success more thoroughly. It is not worth to rely on a good luck only. It also concerns her private life. May, 1 - May, 10 LILY OF THE VALLEY Lily has lavish open heart, often helpless. Bad people profit by this. Woman-lily needs a reliable romantic man. Everything goes well with her job, though excessive eagerness sometimes irritates her boss. May, 11 - May, 21 PURSLANE She is cautious and suspicious of others, even beloved one. Purslane is hard to communicate with everywhere, and in love - especially. You should take care of Purslane. May, 22 - May, 31 CAMOMILE It’s a tradition: love or not. It is difficult to realize her wishes. On the one hand she attracts, on the other hand she keeps aloof. Camomile is seemed like simplicity itself, yet in fact she can expose her college for the sake of career or bet. June, 1 - June, 11 BELLFLOWER Conservative. Bellflower fears any changes. Her rescue is strong family relations and material well-being. She prefers a train to airplane. Bellflower should be more romantic. June, 12 - June, 21 DAISY Woman-daisy does not excel as a romantic and brave girl. She is a goody-goody, homebody, plays safe, careful observer. In social life she tends to gossip. Daisy will gain her ends. June, 22 - July, 1 TULIP She is vigorous and haughty.You may spend your force to conquer tulip’s heart. Try to be more romantic with her. July, 2 - July, 12 WATER LILY An all-rounder. Water, ground and air. Water lily feels right at these elements. She will easily overcome little life obstacles. July, 13 - July, 23 VIOLET She is attractive. Violet usually hides in a shadow, but any moment she may turn up and take everything she wants. July, 24 - August, 2 DOG-ROSE Take care! Avoid touching dog-rose barehanded! Nevertheless do not afraid of the prickles. They serve a protection from brute force and bad souls. August, 3 - August, 12 SUNFLOWER She has found her place under the sun. Woman-sunflower always strive forward, neither conflicts can stop her. August, 13 - August, 23 ROSE Queen of the flowers. Others envy her beauty and charm, weave a plot, wishing to displace her. The rose is unapproachable. Rose, you would better take care about her health and don’t overwork. August, 24 - September, 2 DELPHINIUM Ascetic. She is exacting to everybody excepting herself. Unfortunately, she may become a scapegoat. Delphinium should learn to repulse intrigues of ill-wishers. September, 3 - September, 11 CARNATION Probably there is no a person who has the same straightforward character as carnation has. People don’t like this feature. She holds her own even if the force isn’t on her side. The main thing is to uphold the truth. September, 12 - September, 22 ASTER Aster notably relieves melancholy of the autumn. Like a bright star she disperses darkness with her cheerful temper. Both subordinates and authorities appreciate Aster very much. September, 23 - October, 3 HEATHER Heather is ladylike and romantic. She is irreplaceable expert, all-round craftsman; has a high opinion of herself. Heather is a faithful companion. October, 4 - October, 13 CAMELIA Pleasant appearance. There is a certain refinement in her temper which won her affection. Another feature of her nature is courage. Childish behavior, artistic taste. October, 14 - October, 23 LILAC Lilac is a symbol of blossoming, freshness and youth. She is diligent and purposeful in her work, helps others with great pleasure. October, 24 - November, 2 FREESIA Fearlessness, persistence; obstinacy which sometimes prevents positive communication. Women born under this sign arouse sympathy. This promotes career. Try to be more tactful. Avoid overwork. November, 3 - November, 12 ORCHID Woman-orchid is very mysterious and romantic. She often doubts that causes squabble with others. Believe in yourself! Try to increase your self-reliance. As the saying goes "perseverance wins". November, 13 - November, 22 PEONY Peony has a sound health. In spite of this advantage she must take a recess regularly. Peony should be more discreet and try do not dilate about her plans. November, 23 - December, 2 GLADIOLUS Woman-gladiolus hasn’t any special abilities, but she is very assiduous. Gladiolus will succeed under the direction of a capable manager. She isn’t a boaster. December, 3 - December, 12 DANDELION Dandelion symbolizes warm. She loves freshness, breath of the wind; likes to be at the centre of attention, romance, so of this wish extravagance sometimes passes all bounds of taste and social etiquette. December, 13 - December, 22 LOTUS Lotus symbolizes purity. Thanks to charm, lateral thinking and original thinking, Lotus succeeds in avoiding many problems. Lotus should be more pliant while communication. December, 23 - December, 31 EDELWEISS This flower grows high in mountains. She is a true friend. Though woman-edelweiss has a calm temper, she may lose patience in the vortex of events.